Series 700 train sets on the Tokaido-Sanyo Shinkansen line are used mainly on Hikari between Tokyo and Shin-Osaka / Okayama, and on Kodama between Tokyo and Nagoya / Shin-Osaka apart from on Nozomi between Tokyo and Shin-Osaka, Shin-Osaka and Hakata. 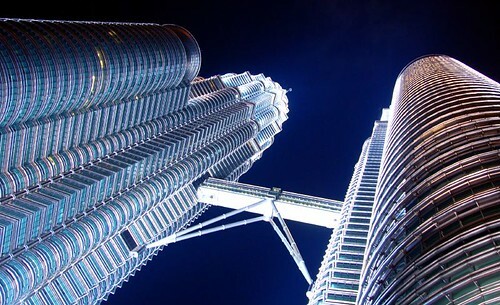 The maximum speed of this is 285km/h. Japan Rail Pass holders can use this when it runs as Hikari or Kodama. I’d like to focus on Series 700 as Hikari operations this time. This train set consists of 16 cars. Cars 1 to 5 are non-reserved, cars 6 to 16 are reserved and cars 8 to 10 are green cars. Cars 10 (green car), 15 and 16 (reserved) are smoking. All the non-reserved cars are no smoking. 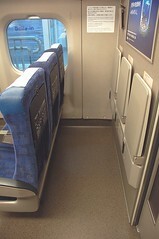 I urge those not smoking to avoid reserving a seat in a smoking car at any cost because it’s very smoky and stinky. 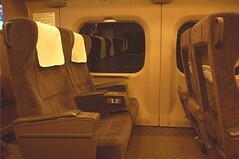 The seat configuration is 2-2 in green cars, and 2-3 in ordinary class. 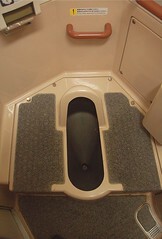 The seat pitch in green car is 1,060mm/41.7’’, 1,160mm/45.7” in ordinary class. 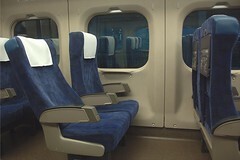 He seat width in green car is 475mm/19”, 430mm/17” except seat B (460mm) in ordinary class. 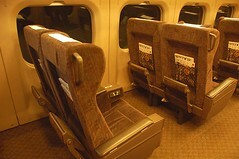 You can see how deep the seats in both classes recline on the photos. 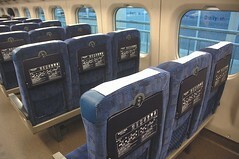 Front row seats in each car have power outlets in the train sets belonging to JR West, and in the some sets belonging to JR Central. 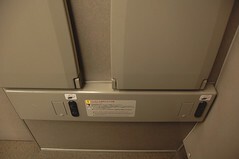 If you have large luggage, you can store it in the space just behind the last row seats. Don’t forget to notify the conductor that you’re leaving it there. 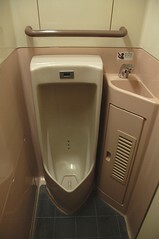 There are a set of one western toilet, one Japanese one, one urinal and two wash basins in every odd number car. They are kept clean. 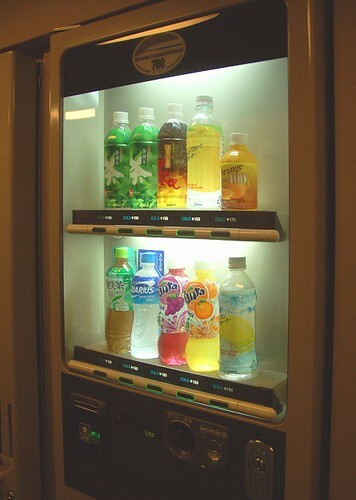 You can find a soft drink vending machine on some cars in each train set. 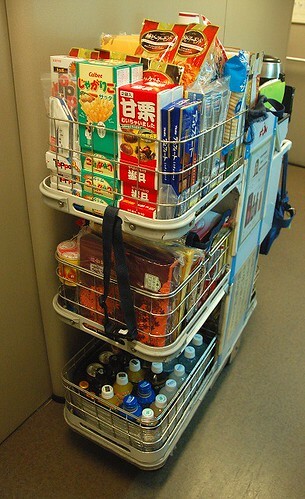 Also an on-board trolley service with lunch boxes (bento), snacks, ice cream, alcohols, soft drinks and souvenirs is available on most trains. Please take a look at the picture to see what kind items are available. 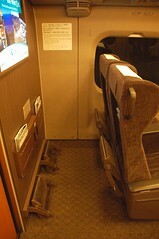 I travelled from in green car of Series 700 Hakata to Shin-Osaka at night of January. 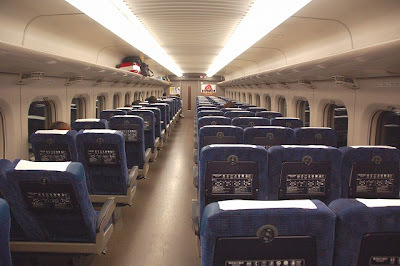 It was JR West’s train set. 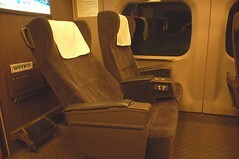 The first impression of the green car cabin was that it was very elegant thanks to well designed lighting and the carpeted aisle. 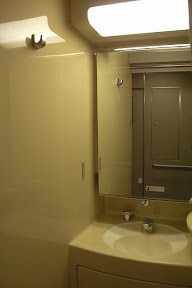 The attendant provided a disposal wet towel to each passenger of green car soon after the train started running. It was refreshing for a exhausted person like me. 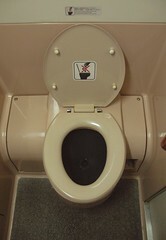 The seat was indeed comfortable with more than enough legroom, wide armrest and footrest. Then it is time to eat ice cream. It’s sold at 270 yen. It’s a blissful moment to enjoy very tasty ice cream seeing the world pass by on the Shinkansen. 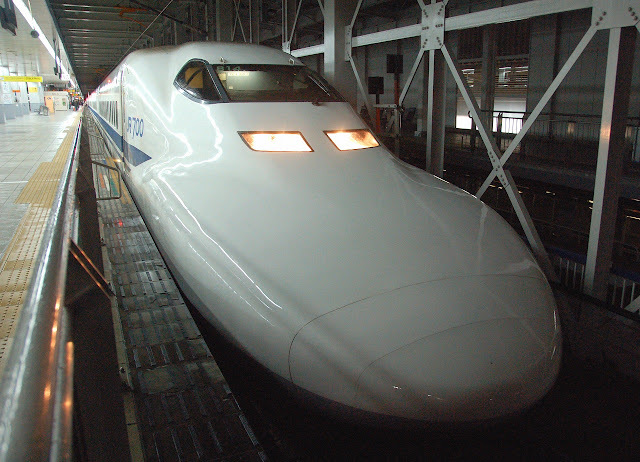 Ice cream fans can’t miss it on the Shinkansen. Train kept running at very high speeds. 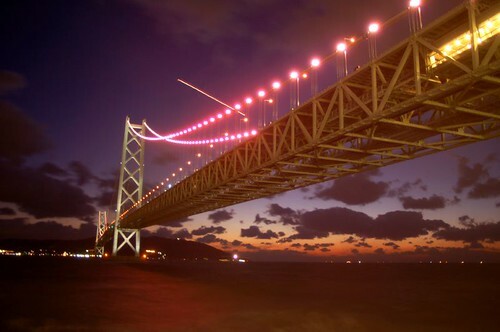 As you see the beautiful Akashi Straight Bridge on your right, the train soon arrives at Shin-Kobe, then finally pulls into Shin-Osaka. 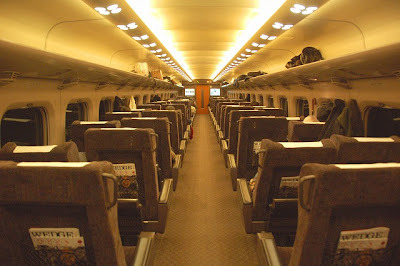 It takes only 2.5 hours from Hakata to Shin-Osaka. 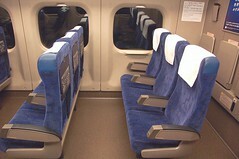 I wanted to remain travelling in the cosy seat, and didn’t want to leave the train. 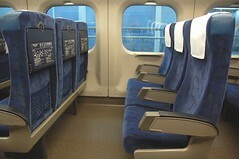 Of course the seat in ordinary class is very comfortable. You just have to share a smaller armrest with someone next to you. On the other hand green car is worth investment when you give first priority to more privacy, more comfort and more serenity. I wish you enjoy travelling on Series 700. This information is really nice and helpful me thank you so much.